Just a few weeks after Government said that a critical section of the multi-billion- dollar access road to the Amaila Falls hydroelectric dam has been completed, there is indisputable evidence that parts of it are washing away. It would raise tough questions now about the level and quality of supervision carried out by engineers. Section Seven, which ends the almost 200-kilometer road from Mabura to the Kuribrong River, Region Eight, was awarded to China Railway First Group (Guyana) Inc. last year for $1.7B after problems surfaced with other contractors over deadlines. Over a week ago, Public Works Minister, Robeson Benn, said that 93 percent of the roadway is complete. In the case of Section Seven, that China Railway built, it was reported since October that the section was completed. Following Minister Benn’s update, and based on complaints that all was not well, Kaieteur News visited the road and discovered significant signs of erosion on the Chinese-constructed Section Seven. What has made the situation more worrying is that parts of that roadway have not even been open to traffic, unlike other sections. As a matter of fact, warning signs have been erected restricting traffic. It was in stark contrast to other sections constructed by local contractors. These are holding up well under the use of heavy traffic from loggers and miners alike. What has made matters worse, said worried persons who took Kaieteur News to the areas, is that the rainy season also has not really started. The little rain that fell just over a week ago saw waters in the valley area through which Section Seven runs, rising quickly, washing away portions of the road built with the red loam. Unlike other sections, the Chinese construction did not include the use of stone. Rather, in the parts seen by Kaieteur News, a rather thin layer of red loam was laid and rolled. During a tour of the area, persons pointed to the design of several bridges and in some cases, the lack of bridges which would prove problematic once the rainy season comes. “We have an area here where the roads are in a valley. The road built by China Rail crosses some of the creeks that have small culverts instead of an open bridge. We are in for serious trouble. The design of this particular section should be questioned and someone held accountable,” said one concerned businessman who is familiar with the road. The washing away has already started. There was evidence that work was being done to repair the damaged sections as evidenced from materials dumped there. Following the sacking of the original contractor, Synergy Holdings back in January 2012, Government had divided the access roads into seven sections. Hassan N Pasha General Building and Civil Contractor was awarded Section Seven for $838M. 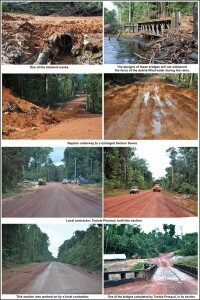 That contract, which was to design and build the road through virgin forest, was terminated in April 2012 after only 15 per cent of the work was completed. Pasha had received almost $315M. The contract was subsequently handed to China Railway for $1.7B. Budgeted originally for US$15.4M, when Winston Brassington awarded that contract to Makeshwar ‘Fip’ Motilall, the cost for the entire road has ballooned upwards to US$30M. Motilall had never even constructed a pavement or sidewalk but Brassington said that he did and gave him the huge contract. The road is crucial to financial closure for the US$850M-plus project, but construction has been facing one delay after the next, not least the difficult terrain. In late October, the Public Works Ministry said that Section Seven was complete. 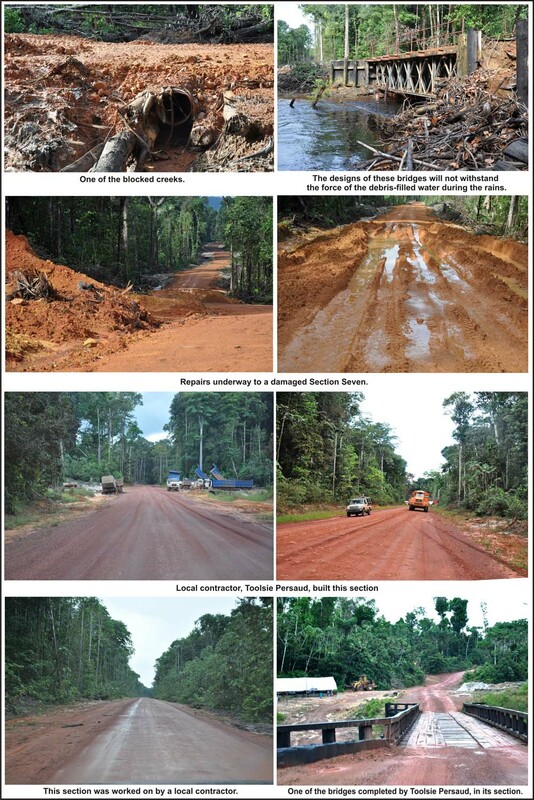 It was also disclosed that Section Three which was contracted to Toolsie Persaud, had a remaining 17 km of roadway left to pave with laterite, while the section contracted out to Ivor Allen Construction Company has an additional 11 km. The road project was being undertaken in a number of segments, with the Ministry of Public Works assuming responsibility for ‘Section Two.’ That section runs along the Mabura Road to the Essequibo River and had a contract price of $336,094,861. Section Three was allocated to Toolsie Persaud Quarries Inc. for $373.3M. That section of the Amaila Falls road stretches from Butukari to the Kaburi Village bypass. The same company was also awarded a contract for Section Four of the road for $246M. Section Four runs from the Kaburi/Omai junction to the Issano bypass. Ivor Allen was awarded the $182.3M contract for Section Five of the road that runs from the Issano junction to Craig Road. Section Six of the road was awarded to G. Bovell Construction Services for $281.7M, but that contract had to be terminated. It was subsequently granted in two lots, with the first from Issano Junction to Sorrow Hill being allocated to Ivor Allen for $145M. The second lot of Section Six was awarded to Dwarka Nauth for $45M. Only recently Head of State, Donald Ramotar, announced that Government would continue to vigorously pursue the hydro project which, if undertaken, would be the largest such project in Guyana. It originally had a tag price of over US$850M. The project fell through after the Government failed to get the Opposition support in passing key legislations that were needed for financing. The Opposition has been demanding answers as to how the monies for the hydro project will be spent.